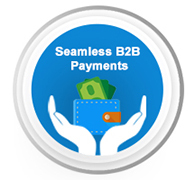 B2B payments are cumbersome, time-consuming and expensive. A transaction between a supplier and a buyer involves procurement documentation, purchase orders, invoices and wait for 30 days or more, multiple financial institutions, and numerous follow-ups. These pain points grow exponentially when these payments are cross-border. Over the past couple of decades, a lot of innovation has happened in the B2C payments sector the B2B payments sector was lagging behind in terms of technology adoption. However, the past few years have seen good amount of investment in the B2B payment sector and as a result a lot of platforms have evolved to automate the B2B payments. The major pain points these platforms have addressed are: High transaction costs, Long payment cycles, Manual processes, Payment errors and delays, Fraud related issues, No or incomplete status updates, inconsistent payment methods, and payment reconciliations. The B2B payment platforms are also attempting to be a one-stop shop for all B2B payment methods. Enable payments between Buyers and suppliers through token. Payee/ Supplier is able to accept and process the card. Payer and Payee have relationships with Debit card vendors. Payments are made is executed by loading the pre-paid debit cards. Bitcoin transactions recorded in a public ledger called block chain. This is either a self-service or Customer Service Representative serviced portal where new businesses can sign up for the platform. During registration the business profile undergoes the KYC, Risk/Fraud, AML checks to ensure that the business is in good standing. Usually, this is where based on the business preference, various payment methods(ACH, Check, Credit card etc.) are used. This capability gives the flexibility to charge different pricing for different methods and different volumes. This capability leverages a rule, workflow engine. These basic or core capabilities are integrated into multiple internal system or records during the transaction lifecycle and also exposed as API for internal or external consumption. Innovecture has helped its clients define B2B technology strategy, architecture and build the B2B payment platform. Know more on what Innovecture has done in this space. The client wanted specific business objectives such as Plug and Play based API Experience, Configurable KYB/ KYC, Suite of Payments Methods (ACH, Check and Token Card).